Over the past few years, the CCM High Performance program has provided opportunities for players like Ryan Donato, Charlie Coyle, Jack Eichel, Noah Hannifan, Frank Vatrano and Jimmy Vesey. The players below have been selected for the 2018 Massachusetts Hockey CCM High Performance Festival. 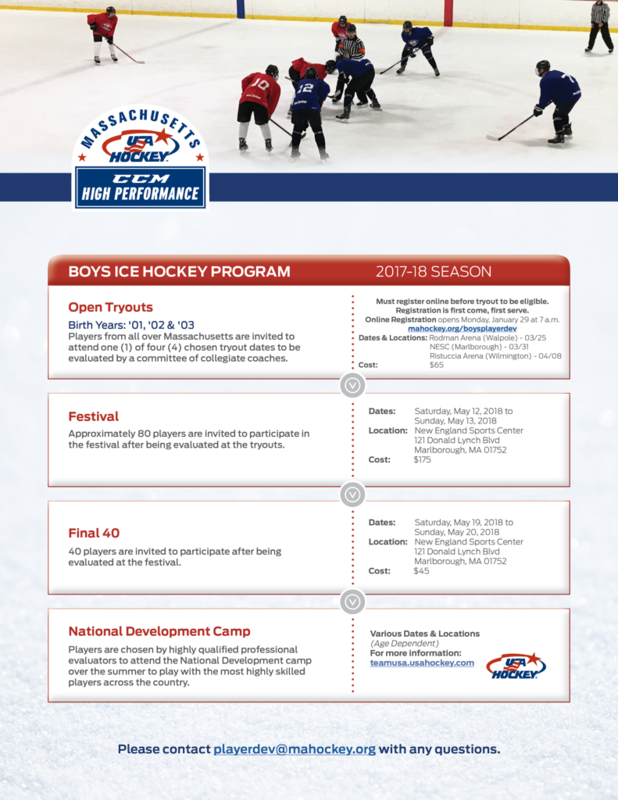 Over 700 male youth players were evaluated at various tryouts taking place over multiple weekends in March and April of 2018. Goalie selections have not been posted yet. Expect goalie selections to be posted after Monday, April 30, 2018. The festival will take place Saturday, May 12, 2018 to Sunday, May 13, 2018 at the New England Sports Center, 121 Donald Lynch Boulevard in Marlborough, MA 01752. After the Festival, approximately 40 players per birth year will be selected to participate in the Final 40 on Saturday, May 19, 2018 to Sunday, 2018 at NESC in Marlborough, Mass. After being evaluated at the Festival and Final 40, selected players will be invited to participate in the 2018 USA Hockey National Player Development Camp in June or July. Click here for the camp schedule.